It was an old friend's birthday so I met up with her for a day of fun last week. I bought her a fall candle and candle holder from Bath and Body Works and I made her this cute, humorous card. 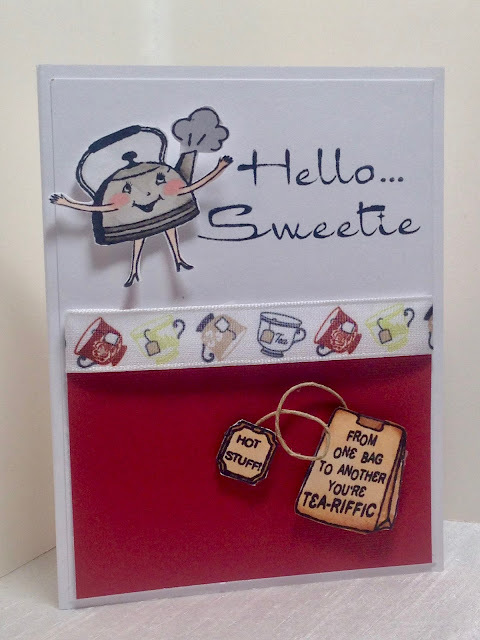 I was nervous about giving her a humorous card because I know some women can be sensitive about their age, so I added "Hello Sweetie" on top so she would know it was all in love. The vintage images are from Crafty Secrets. 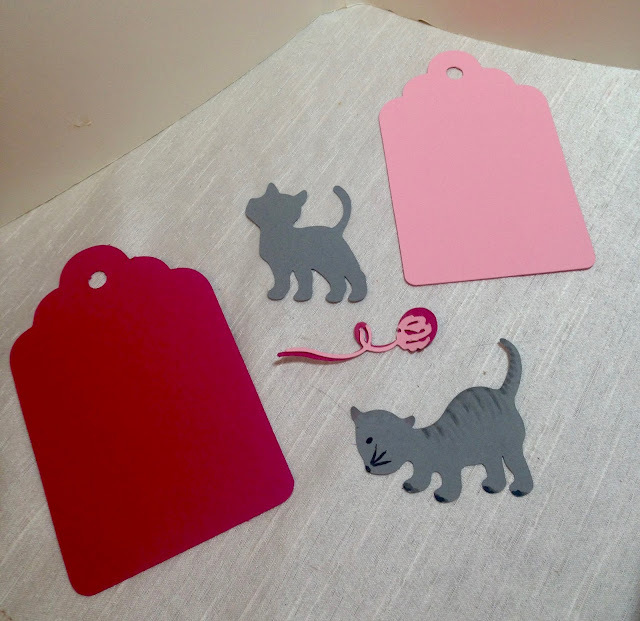 I stamped them on separate paper, colored, cut them out and popped them up on dimensionals. The tea cup printed ribbon was from my stash; purchased at a craft store years ago. I added a piece of hemp to make the tea bag more realistic and interesting. This is the first card I've made in a long time where I didn't copy someone else's design, but I'm embarrassed to say how long it took me to make it. It's so much quicker and easier just to case someone else's card. I struggled so long with the layout of this card. Initially I did try to use someone else's layout, but it wasn't working with my images. I find that small images are the hardest to make cards with. I also gave my friend a gag gift. I was sharing a story with my hair dresser that my friend came over to my home recently and was freaked out by my cat. It seemed the more my friend was freaked out, the more my cat freaked out. She really is not a cat person. We cat lovers are a special breed of people. We know how to handle cats because we understand them. I find that people that don't like cats, just don't understand them. When my hairdresser heard the story, she laughed and laughed and said, "Oh, you have to buy her a gag gift! 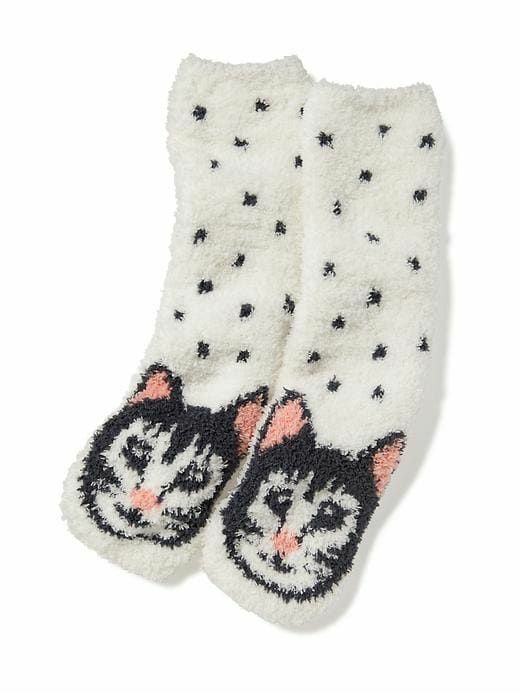 Get her some kitty socks from Old Navy! 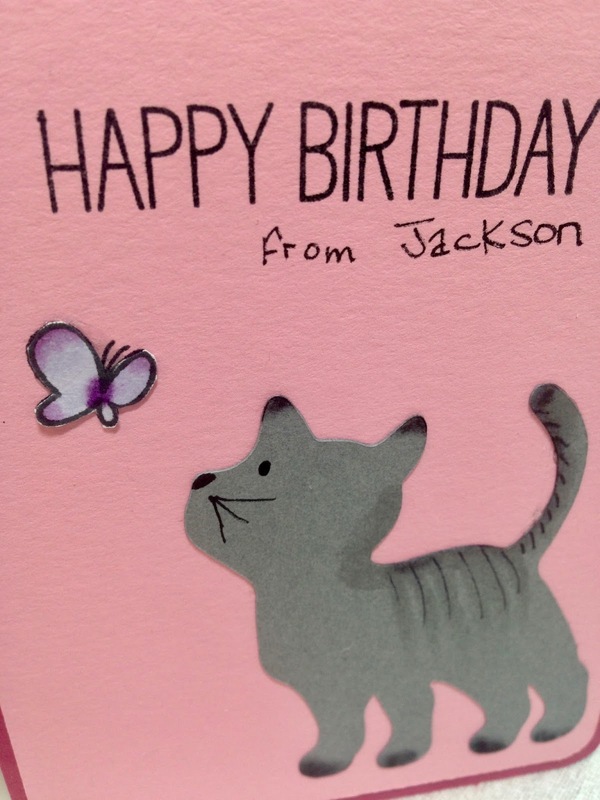 Better yet, say it's "From Jackson". 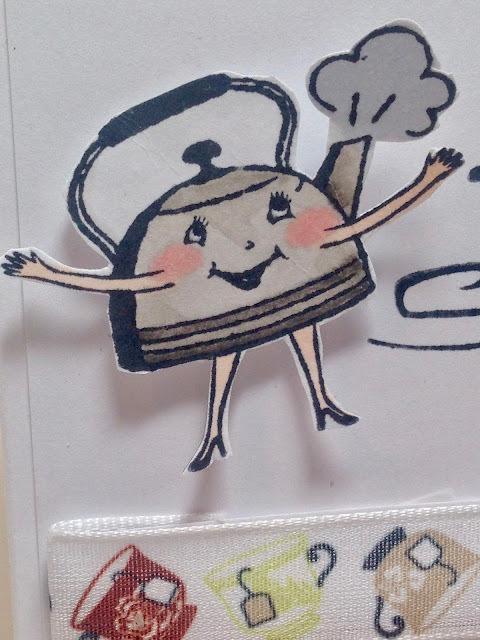 I cut all the images out with my Cricut Expression machine. I hand drew some details onto the cat cut out so it would look more like Jackson. 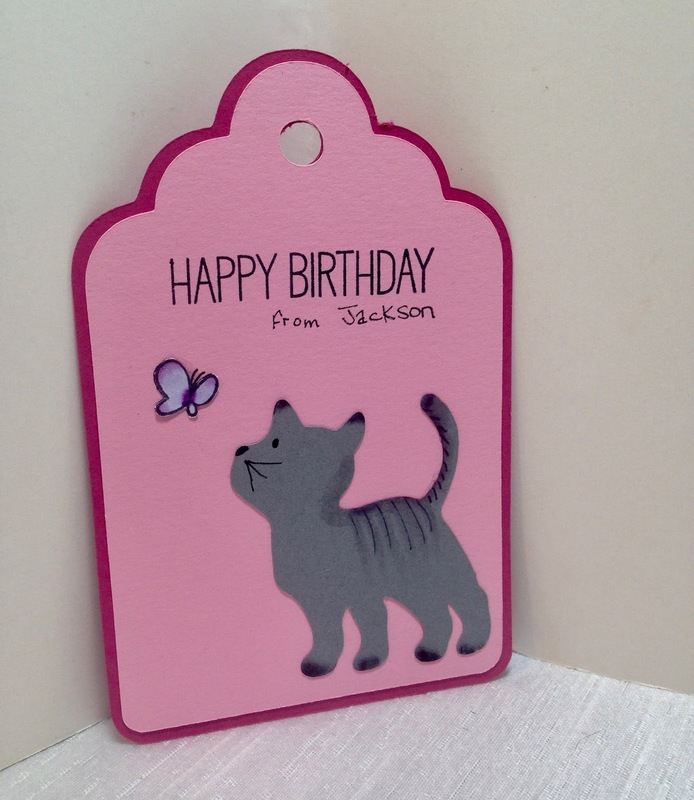 I used a stamp for the "Happy Birthday" sentiment and then hand wrote "from Jackson" on the tag. The butterfly was stamped onto a separate piece of card stock, colored, cut out, and then glued onto the tag. And these are the cute slipper socks I gave my friend. They look just like Jackson don't they? Lovely story, Amy, and such a thoughtful and painstaking process behind the card and gift. Well done! My cat snarls at all "intruders" (friends and family, especially GKs), yet he too snuggles up next to Mummy in bed each night, bless his cotton socks! Hugs, x. Thank you! I'm glad to know I'm not alone. Jackson so rarely sees anyone other than my husband and I so he's afraid of new people, but he eventually warms up to them if they don't act 'fearful' and give him more anxiety. 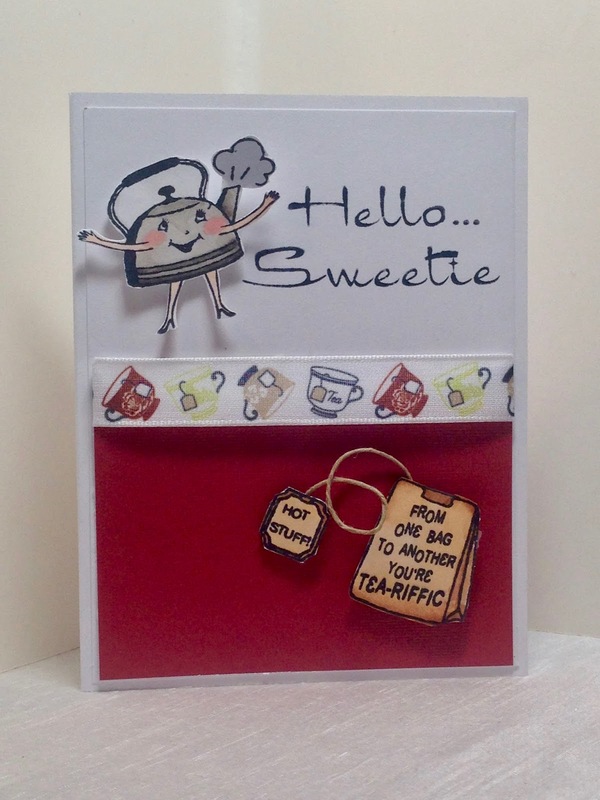 What a fun birthday card Amy, yes it takes forever to make cards from scratch, that's why I started making simpler layer cards most of the times now, and I really enjoy them, but the "thinking what to make" still takes me a while. 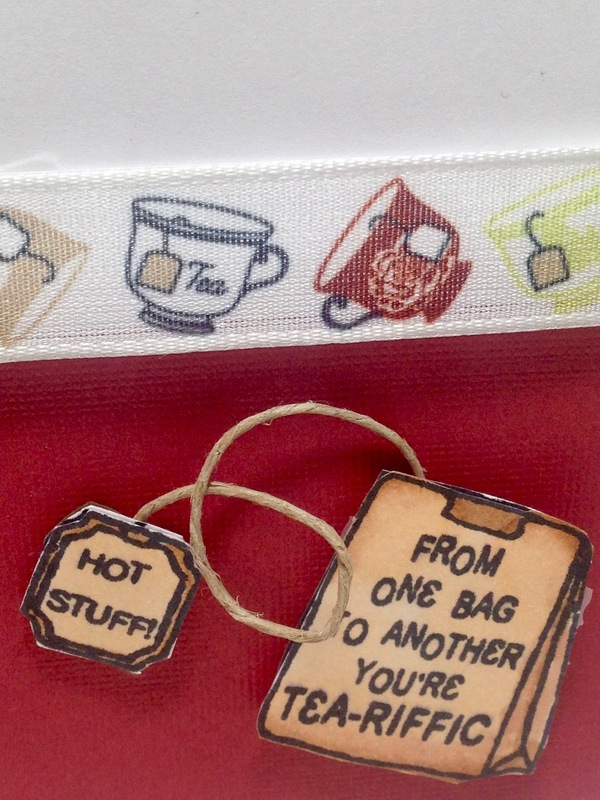 The tag and socks are really cute and a fun addition to the gift! I totally think you are right about people not understanding cats. Can you believe that less than 10 years ago I thought I "hated" cats. I had two cat incidents when my son was a a baby, once this cat just came up to me in my backyard meowing and following me while I was out there playing with him (my son), it freaked me out I was so scared, and had to go in the house, my husband just laughed at me. Then my in-laws had kittens, and while my son was in his baby carrier (he was about 3 months old) one of the kittens came running like crazy towards my son to jump on the carrier. I still remember how that freaked me out and ever since those two incidents I told myself I hated cats. A few years later we decided to get pets for our family, we thought about a dog, but it didn't work out, so when my husband stopped at the local shelter and told me about this cute orange kitten, I told him to get him. Fell in love with that little stinker the minute he came home, flea infested and all (he was an ally cat someone dropped off at the shelter). And I knew I wanted to get two cats so they have a companion, and we still had a certificate from another shelter, we ended up bringing the other kitty home a couple of weeks later. Two totally different cat personalities but I love the both and I would have never thought that day would come where I would be such a crazy cat momma :) Ok, this was long but I always love talking about kitties!! Thank you! Wow! What an amazing story, but so very true. I think people that hate cats just don't understand them, because if they did, they'd be in love with them! Haha! Oh gosh, that is hilarious about giving her a gag gift from your cat. LOVE it! I love the first card design, too! And it is humorous too! Very nice job, so clever. Thanks Diane! I'm so happy you stopped by! Awww, thank you Michelle. He's my fur baby! Your little fur baby is so adorable, Amy! He doesn't look so mean ;) He is, after all, the greatest little gift-giver around! Awww, thank you! He is my sweetie!